Moneta standing left holding scales and cornucopiae. Star in left field, B in right field, Star SIS in Exergue. hinterlassenen Sammlung und Aufzeichnung des Herrn Paul Gerin" (Voetter-Gerin), Siscia, Galerius Maximianus, p286, nr 18. 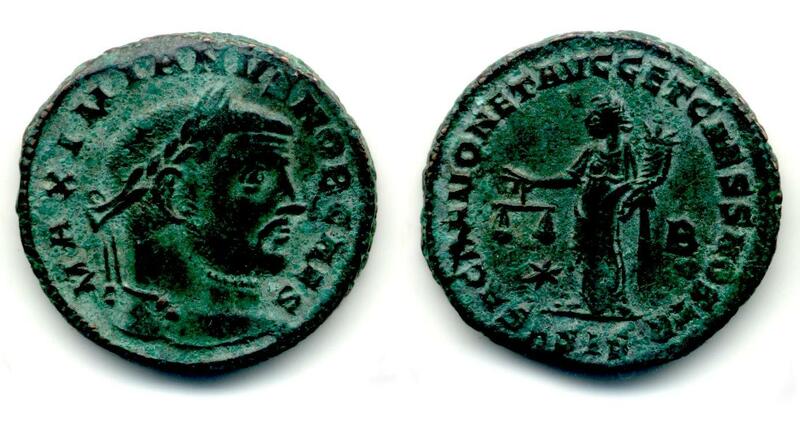 Failmezger, V., "Roman Bronze Coins From Paganism To Christianity 294-364 A.D.", nr 28G. Van Meter, D., "Handbook of Roman Imperial Coins", p282, nr 35.